We offer technical assistance through interventions that build VET system capacities. The VET Toolbox is happy to receive requests from public authorities, social partners and private institutions. These can be: ministries responsible for VET and employment policies; national vocational authorities and regulatory bodies; training funds; quality assurance/examination organisations; public and private VET training institutions; VET pre-service and in-service instructor training institutions; national, regional and sectorial business and professional associations; civil society organisations; as well as national and international enterprises involved in VET partnerships. EU Delegations and country offices of the European implementing agencies can support partner institutions when requesting support from the VET Toolbox. The use of VET system and labour-market analysis to strengthen evidence-based policy making and programming. This can include providing expertise on the use of labour market information systems, rapid labour market assessments, gap analysis tools, employment labour market assessments. Private sector involvement in VET and labour market activities. This can include providing expertise on involving the private sector in sustainable mechanisms of consultation and cooperation, financing, governance, training delivery, career guidance, Public-Private Partnerships, participation in advisory councils, curriculum development, definition of assessment standards, management of training centres. Strengthening the inclusion of vulnerable groups in VET and formal and informal labour market activities.This can include providing expertise on working on recognition of prior learning; mechanisms of social dialogue in VET system; improving VET for vulnerable groups; perception of VET opportunities for disadvantaged groups including for women; upgrading skills for the (in)formal sector; job placement with a focus on vulnerable groups; affirmative action initiatives for young women; promotion of methodologies for special needs, etc. We work in EU partner countries, excluding those countries that receive support from the European Training Foundation (ETF). Particular attention will be given to support requests from countries benefitting from the EU Emergency Trust Fund for Africa. Read the guidelines. Any questions ? Contact us on info@vettoolbox.eu. Fill in the request form online or download it and fill in on your computer. Submit your request online or by email to info@vettoolbox.eu. Public and private institutions from a partner country undergoing a VET and labour market reform can submit electronically a request to the VET Toolbox. The VET Toolbox Coordination Hub assesses the request. If the request is eligible, it defines the support intervention in dialogue with the requesting institution. Then the short term expertise is selected and fielded to work with the requesting institution/s in the partner country to find the most appropriate solution to the support requested. Our services are demand driven. 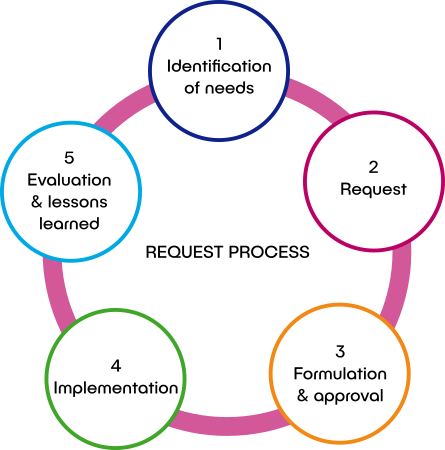 To access our services, the first step is to formulate your needs in our request form. Our technical assistance services are punctual and limited in time and investment. Make sure your request takes into account that we can assist you for up to 5 weeks. Our technical assistance services are tailor-made. We assess the needs you formulated and see what modality is the best answer to your need. Is it advice, training or twining or a combinations of these modalities? We decide on our service proposal together with you. We source the highly specialised experts and practitioners to deliver the services from our agencies’ expert networks (LuxDev, Enabel, British Council and GIZ). Our technical assistance service comes free of charge to you. But please note that we only cover the costs relate to the experts we deploy. We cannot cover costs related to the participation of your staff.